Farmers we work with regularly live hand-to-mouth. Whatever they have, it's only enough for today, if even that. Tomorrow, they will go out to their fields to get some more food, they will go to the market to sell a handful of tomatoes to afford a bar of soap, or they will simply beg from a neighbour. One thing that can help a farmer to get his head above water long enough to save and plan for the future is to diversify his income. A farmer who relies entirely on one small irrigated garden may produce enough food for his household, but what about school fees? Clothes? Medicine? 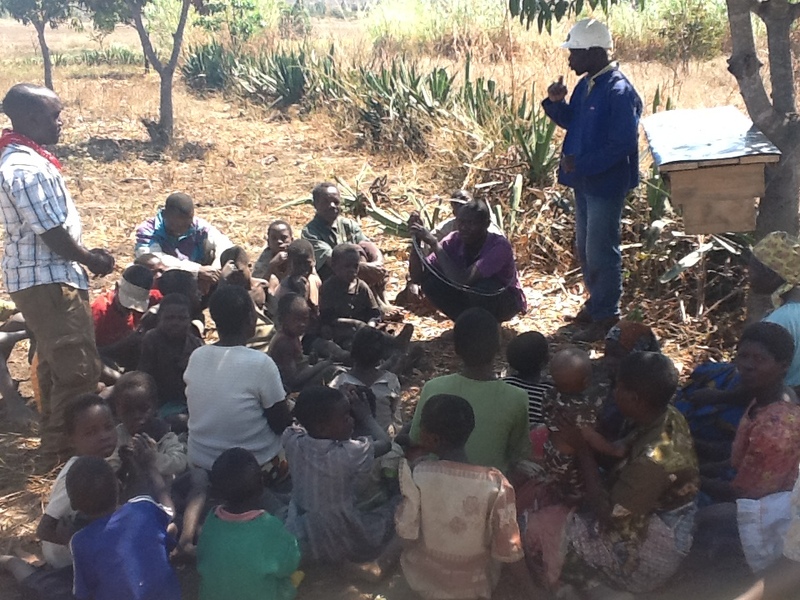 Africa Windmill Project is introducing bee keeping to the Mziza farming club. The club will share 5 beehives to start with, and expand later out of proceeds from selling honey. The benefits of beekeeping are threefold: first, there is the income from selling honey; second, the nutritional benefit of eating the honey; and third, the bees will help pollinate crops. Oh yes, and the farmers will be encourage to conserve their forests. And also, they may use the beeswax to make candles or soap. OK, so that was fivefold... and the benefits only get better as the farmers make more hives. Mziza club members received their first hives on Tuesday. They had never seen the Kenyan Top Bar hive design, and thought it looked a lot better than their traditional hives, which consist of an overturned clay pot. They quickly went around hanging the hives in various strategic locations. At the same time, AWP staff members were teaching them about how to monitor the hives for pests and overflowing honey. The club should bring enough money to purchase one new hive for each one they harvest. 5 become 10 become 20, 40, 80... within about 18 months. The limiting factor is of course space to hang them. This is where forest conservation becomes worth doing, so to speak. Without growing their forests, the farmers cannot grow their collection of hives. Last week on Friday we installed a water pump into a domestic well. This is the second pump we have installed for domestic use, and the first that will be shared and used by a village community. (The other domestic pump is used by an individual in a village setting). Almost 3 weeks ago, the chief at Mziza approached the AWP coordinator in his village asking if the it is possible to use the pump to draw water from their domestic well. We knew it was possible, and had plans to install one in some village at some time. What better time than now, when we have been invited to do so by the chief? We had a crowd around as we began the installation. The usual suspects where there: club chairman, club members, village chiefs, and a whole bunch of interested kids. There was little need to do in-depth training, since some of these guys have installed their own pumps before. The club members have agreed to help the community get used to the new pump and keep an eye on any maintenance issues. The pump will help keep the well clean. But the responsibility still falls to the community to make sure that their drinking water is safe. It doesn't matter how hard you try, if cows are drinking this close to the well, it will be contaminated.